The Hayworth Cancer Center at High Point Regional receives Women’s Choice Award® for providing exceptional patient care and treatment in cancer care. The Hayworth Cancer Center at High Point Regional has been named a Women’s Choice Award® recipient as an America’s Best Hospital for Cancer Care, acknowledging the Hayworth Cancer Center at High Point Regional‘s dedication to providing exceptional patient care and cancer treatment care for women and their families. According to the American Cancer Society, Cancer remains the second most common cause of death in the US, accounting for nearly one of every four deaths. Moreover, one in every three women has a risk of developing cancer during their lifetime. Considering that the percentage of medical error for delayed, missed, and incorrect diagnosis is in the range of 10 percent to 20 percent, making the best healthcare choices is critically important (The Journal of the American Medical Association, 2012). Considering women are responsible for 90 percent of all healthcare choices, as recorded by the American Academy of Family Physicians, the Women’s Choice Award empowers women to make smart choices by validating her decision in making the critically important choice of selecting the best cancer care program. Among the elite group of 337 hospitals, the Hayworth Cancer Center at High Point Regional earned the 2014 Women’s Choice Award because they have met the comprehensive cancer care standards of the American College of Surgeons Commission on Cancer, as well as for their excellence in clinical performance with regard to cancer care measures, and for their high recommendation rate, a measure that is very important to women in choosing a hospital. The Women’s Choice Award is the only distinction that identifies the nation’s best healthcare institutions based on robust criteria that considers patient satisfaction, clinical excellence, and what women really want when it comes to treatment and a quality hospital experience. “Almost every woman in America has been touched by cancer. When left undetected and untreated, cancer can be a silent killer at any age. It is now more important than ever to make smart healthcare choices to screen, diagnose, and fight cancer. One of the most important decisions a woman will make in her battle is the hospital she chooses to fight this disease,” states Delia Passi, CEO and founder of the Women’s Choice Award program, and former group publisher of Working Woman and Working Mother magazines. “As one of America’s Best Hospitals for Cancer Care, the Hayworth Cancer Center at High Point Regional is demonstrating their commitment to fulfill the needs and preferences of women by meeting the highest standards of excellence and performance,” adds Passi. The Women’s Choice Award program provides women with a trusted third party endorsement based on hospital experiences by patients in their community and supports that with clinical consideration. By carrying the Women’s Choice Award seal, The Hayworth Cancer Center at High Point Regional has joined an elite network of hospitals committed to a global mission to empower women to make smart healthcare choices. “High Point Regional is proud that our Hayworth Cancer Center has been recognized as a Women’s Choice Hospital. We place a tremendous emphasis on quality, performance and satisfaction, and this honor is proof positive that our efforts are making a difference to the hospital and the local community that we serve. I am delighted to be able to celebrate this award with our physicians, staff and community,” said Ernie Bovio, CEO and President of High Point Regional. “Women spoke and clearly defined what’s important to them when seeking the best cancer hospitals in America and the standard of excellence they expect for themselves and their families. As one of America’s Best Hospitals for Cancer Care, the Hayworth Cancer Center at High Point Regional was selected due to their accreditation as well as offering services such as chemotherapy, radiation, hospice care or cancer research,” says Delia Passi. Women have many choices when it comes to cancer care. Now they can make informed choices based on the recommendations of others who have experienced that hospital. 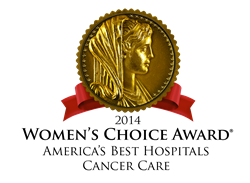 Most importantly, when a woman sees the Women’s Choice Award seal at her local hospital, she’ll know the hospital values her experience as a critical component of care for her and her loved ones. High Point Regional Health, a member of UNC Health Care, is a private, not-for-profit health care organization with more than 2,200 staff. High Point Regional offers 351 private beds for medical and surgical patients serving over 120,000 patients each year. High Point Regional has its foundation in six primary service areas: Carolina Regional Heart Center, The Hayworth Cancer Center, The Neuroscience Center, The Esther R. Culp Women's Center, The Emergency Center and The Piedmont Joint Replacement Center. High Point Regional's mission is to provide exceptional health services to the people of this region. For more information, visit HighPointRegional.com.